In my quest to live the most healthful and fulfilling life possible, I’m interviewing people I admire on what healthy living means to them. My first installment of ‘Living Well’ features the gorgeous, smart and kind Sonni Abatta, who epitomizes beauty and brains. I worked with Sonni in Orlando when she was the evening news anchor at Fox 35. I always admired the way she carried herself both on and off the air (and I still do). 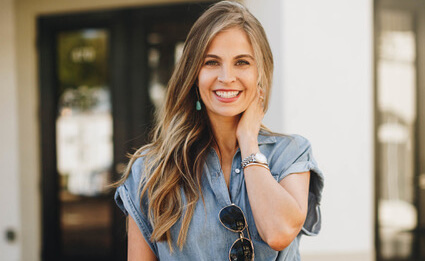 Sonni recently traded in her news gig to spend more time with her three little ones as well as more time blogging. Through her writing, she provides a fresh take on motherhood, beauty, home, fashion and more. To check out her blog, visit the link at the end of this Q & A. And without further adieu, here’s Sonni Abatta. What is your overall philosophy on “living well?” Is wellness something that plays a role in your everyday life? How so? For me, living well reaches into multiple parts of my life and routine. To me it’s important to get a decent amount of physical activity (I try to work out 2-3 times a week, which with three kids under 5 is a feat in and of itself!). I also eat relatively well, which to me is lots of fruits and vegetables, little refined sugars, not too much red meat, no pop and very little alcohol. But in addition to the way I move and eat, I also find that achieving a certain level of creative fulfillment is key. Lately that has taken the form of writing, blogging, and doing weekly interviews on topics of interest to me on my Facebook page. I’m a retired TV news anchor, so I love being able to continue to engage with people on topics that I find interesting. Sharing information and stories feeds my soul in a big way. When you feel like your soul is being nourished by your work, you know you’ve found your calling. What about when it comes to nutrition. What does “eating well” mean to you? Is there a particular kind of diet you follow or foods that you avoid? While I believe in treating your body to the best foods possible—fresh, whole and organic—I am also a big believer in indulging. I don’t exclude any types of food from my diet; in fact, I’m one of those rare people who hasn’t banned carbs from my diet. I’m Italian, and grew up eating tons of pastas and breads, and my body is okay with them, so no gluten- or carb-free for me! I do make sure to eat lots of organic fruits and veggies (at least one serving per meal), I keep red meat to a minimum, don’t eat much refined sugar, and I rarely drink pop or alcohol. All that being said, I do have three kids, so McDonald’s and Chick-fil-A are also part of our lives once in a while, and I don’t feel too guilty about it. You said you exercise two to three times per week. What kind of exercise is your favorite? I do exercise regularly, though not nearly as much as I’d like to! I do barre3 classes 2-3 times a week, which has been tremendous for me in terms of gaining core strength and improving my overall muscle tone. I also walk outside a lot (living in Florida has its benefits! ), and I also am heaving around three kids ages five and under on a daily basis, so there is always some kind of unintentional weight lifting involved in my days. Whoever said that chasing around kids was its own form of exercise was not kidding! I don’t sit much, if at all, during any given day. I literally fall into bed every night. Are there any wellness rituals you do daily? I drink hot lemon water on an empty stomach every morning, first thing, and right before bed as well. It was a ritual I started when I was pregnant with my third baby, and I find it to be so soothing. I also oil pull at night with coconut oil and have found that it has really whitened my teeth. Other wellness practices of mine include dry brushing before my nighttime bath or shower. I also take probiotics and a liquid vitamin D supplement and use Epsom salts in my baths. On the spiritual front, I am an elementary-level meditator/chantor, and it’s all thanks to the book The Buddha in Your Mirror. After a friend recommended this to me, I read and loved this book so much for the simple and practical advice it gives on the benefits of meditation. I now always in turn recommend it to other friends, because even if you’re actively practicing another religion, it always helps to learn new ways to destress and relax, and meditation or chanting can give you a direct line to that. You recently decided to leave your job as a news anchor to stay at home with your kids. What prompted you to make that decision? My shortest possible answer to that is one word—exhaustion. But of course there’s more to it. While I was extremely proud of the work I was doing and absolutely loved delivering information to people, the juggling of the mom/work duties became overwhelming. Like many working moms experience, I was wearing two different hats, and with working the night shift, where my hours were 2pm-11:30pm, it got to be quite physically exhausting. I began to crave a normal routine, where I could put my kids to bed and then sit on the couch, relax and watch TV or read—just be a family, together, without having to rush out the door all the time to return to work. It’s not a decision I made lightly, and I’m so grateful for the time I spent in news. But I’m happier than ever being at home right now. What are you enjoying most about being home? I can now spend time with the kids while also working on creative projects about which I’m truly passionate—many of which revolve around writing and interviewing and sharing information for other women in the motherhood, lifestyle and wellness realm. Whether I’m writing for websites, blogging on my own site or interviewing people live on my Facebook page (TV news habits die hard! ), it is so fulfilling to be able to share information with women who are in the same life stage as me, and do it without a filter or time limit. Did your definition of wellness change when you became a mother? Absolutely! In short, it’s much broader. That’s due in large part to the fact that my wellness now encompasses their health and their happiness, too. So much of my time is now dedicated to doing things to ensure those things for them, so in turn I lose time for my own self-care. But I’ve found ways around the mom exhaustion. I plan on having a sitter several times a week for part of the day so I can write, plan out my blog posts for the week, work out and grocery shop. It may seem selfish to carve out time to do those things, but these short bursts of self-care are to me like premium fuel for my gas tank: They keep me running at a better efficiency. I’m such a big believer that women—caretakers that we tend to be—need to take time away from that never-ending hamster wheel of responsibility to take care of ourselves. Whatever this means to you—exercising, spending time with friends, meditating, writing—it ends up making you a more whole person in the end. You are an advocate for clean beauty products (and a consultant for Beautycounter). What made you start thinking about skincare safety? Like many women, I became very conscious of the ingredients in my personal care products after becoming pregnant with my first baby. Until you have an occasion to consider it, you really don’t think about how many personal care products you’re slathering on your body daily, and how many of those ingredients are being ingested or partially absorbed into your body. I immediately began to switch over to brands I felt were more conscious in their ingredient selection, and from there, my interest and investment in “safer” beauty products snowballed. As a practice, I try to avoid ingredients like parabens, sulfates, artificial fragrances, retinyl palmitate and phthalates. I absolutely love working with Beautycounter because first and foremost, their products perform. I worked in television for 15 years, so believe me when I say I have sampled just about every brand on the market when it comes to makeup and skincare, and I have been so happy with the results I’ve seen with Beautycounter. But more than great products, it’s also a company that operates to change the standards of “safe beauty” for everyone. So you don’t have to be a consumer of their products to benefit from the changes they are pursuing. They are educating customers about what’s in their products. They are pushing lawmakers to ban harmful ingredients. Overall, they are more than a line—they are a movement. So that, I can get behind. And let me just say this: If everyone switched over just one or two of their products to a safer line, they would be surprised at the results and happier knowing they’re taking just a small step toward a healthier life. When it comes to using clean beauty products, do you think it needs to be an all-or-nothing effort? No, absolutely not! That’s the beauty of this movement. Living well is an awareness. It’s a journey each person decides to embark on, and as a result of that, it happens at your own pace. Imagine how overwhelming it would be if someone said to overhaul everything in your life all at once—your diet, beauty routine, cleaning products, etc. It would be a nightmare! I now am about 80/20 when it comes to using clean beauty products versus traditional ones. I’m passionate about wellness and safer beauty because I believe it matters. What you put on your body and in your body—it all adds up. Why not take advantage of the massive amount of knowledge we now have about the safety of our daily products and do something with it? Take one step or take a hundred—they all matter. What are some of your favorite clean beauty products? I’m in love with our Beautycounter Countermatch line—the whole thing! The Adaptive Moisture Lotion is a game changer; it really does adjust to the level of moisture your skin needs and isn’t heavy in any way. That and the Countermatch Sleeping Cream are my favorites. I’m also in love with our Dew Skin tinted moisturizer and our lip glosses; they’re moisturizing, smell good and give the perfect pop of color. The Drunk Elephant C-Firma Day Serum is a great antioxidant addition to anyone’s skincare routine. I am also using nfuse deodorant, which is a natural, aluminum-free option that also gives your body a dose of magnesium, which many people are lacking. Every night I also use a coconut oil pulling packet from Kopari Beauty. I just started incorporating oil pulling into my oral health routine and already I notice my teeth are whiter and brighter, without having to use any harsh chemicals. I’m also a big fan of Honest Beauty’s loose setting powder, which I use with a fluffy brush to set my makeup. I could go on and on, but these are some of the ones that stand out! Living well is attainable for everyone! It’s not a matter of having extra time or money; there are countless ways to live a little better, just by making small changes. Switch over to a safer deodorant (one without aluminum). Start using a moisturizer with a physical sunblock instead of a chemical sunscreen. Drink a glass of hot lemon water to start and end your day. Sit still and be quiet for five minutes a day while breathing deeply. Any or all of these can all enhance your health. Try them and see how you feel! That’s the beautiful thing about our day and age. More than ever, we are aware of how our habits and environment can impact our wellness. Why not take small steps toward making your life better? Be sure to check out Sonni’s blog, SonniAbatta.com.